Hi all! Hope you're having an enjoyable weekend. As I work on changing my Etsy shop over to primarily a crochet pattern store, I thought I'd share a cute free pattern that's super simple and quick. Below you'll find a written pattern followed by a photo tutorial to help if you're new to crochet. Enjoy! And be sure to leave a comment if you have a question. For this pattern, you will need a small amount of lace weight yarn, a size "G" crochet hook (4 mm), a yarn needle, scissors, jewelry chain and findings (clasps and rings), and wire cutters and benders. On the bottom right you'll see some necklace backs, which are optional and will only use if you want your bow to be able to slide on the chain. Fasten off and weave in ends. 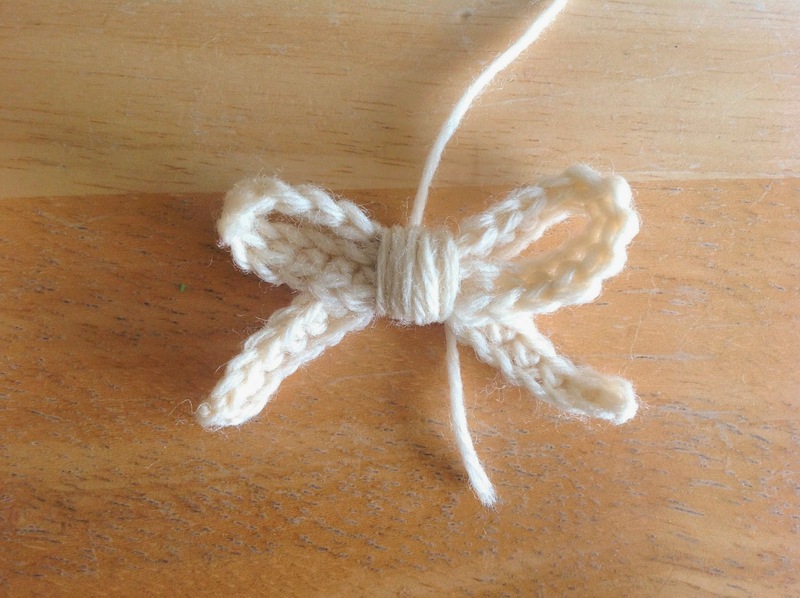 Fold into a bow shape and wrap center with yarn. Knot end and weave in ends. Attach to necklace. Going down one side of the chain, single crochet in the second chain from the hook and in each stitch across. You'll have 44 single crochet stitches altogether. Fasten off the end and sew in both ends so you have one strip of single crochets. Fold your strip into a bow (or pretzel, hehe) shape. Once you have the proportions right and both sides of the bow look even, tie a long piece of yarn in a knot on the back. Wrap the yarn around the center until it looks like this, then cut and knot the end and sew in. Option One: If you want to be able to slide the bow along the chain, you'll want to use one of these necklace pendant backs. Hot glue it to the back, cut your chain to the desired length (to be at the length shown, cut it at 19" long), and assemble your necklace. Option Two: If you'd like your necklace to be stationary like in the photo at the top of the page, cut your chain into two 8.5" lengths. Attach the chains to the back of the bow using rings as shown in the photo to the left. For both options, this is how I assembled the clasp end of my chains. I used a clasp and two rings (I'm sorry, gals... I don't know the technical terms!) and connected them using pliers to open and close the rings. And that's it! Super cute necklace in no time! If you'd like to see more of my patterns, check out my Ravelry store here. I hope you have a great week!